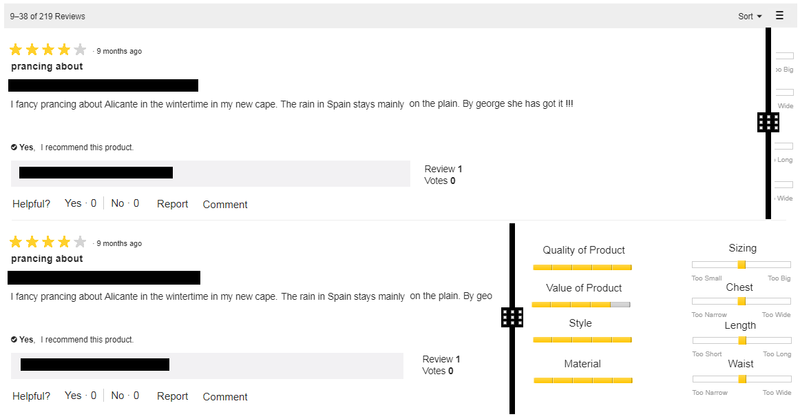 I'm looking into re-designing product reviews on an ecomm website. My primary objective is to reduce the length of the page as right now it's kind of ridiculous. My plan is to create a slider that shows extra content once swiped across which then hides the original content. Behaves the same the sliders on car websites when you pick between two different colours. The question I have is, do I have the slider on the left or on the right? I.e. do I want people to swipe/slide left to show the extra information or swipe/slide right to left. This is for a LTR reading audience but I'm wondering if there one of these directions is more intuitive to a user who hasn't seen this type of function before. Next option for me is to create a tool tip (or something along those lines) to explain how this function works but again, I'm trying to reduce the content on the page upon initial load. By default, your slider should work from LTR as that is how a majority of sliders work. From our web browsers to various web application, we are used to sliding from LTR to view the content which is hidden. Tooltip looks like a overkill here as sliding to view content would be pretty intuitive. Not the answer you're looking for? Browse other questions tagged user-behavior user-expectation or ask your own question. Interface for image editor app with many tools for small touchscreens? Best way to show the user a div have more details, will be shown upon click - arrow/grid icon/'>>'/'more details'? Do users like to feel more special than the elements of a webpage? What is the best way to show the user they have watched a video? Slider on Mobile - labels below or above slider?